The Mercia Shiplap Reverse Apex 8 x 6 Shed is a very attractive looking 8 X 6 shed that actually offers a decent amount of storage space. 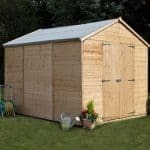 This shed offers that little bit extra storage space than you normally get with a 8 X 6 shed. 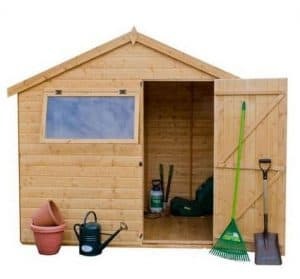 The shed has a lot of style that is sure to make it stand with pride in your garden. Speaking of which, while this offers a good amount of storage space, it does not take up a whole load of space in the garden. The reverse apex design is very smart and a large door and good sized opening window just finish off the shed nicely. There are some very good features with this shed. The cladding is a major highlight. It looks fantastic, but at 12 mm thick, this tongue and groove shiplap cladding keeps the water out and is very strong. Inside the shed is a solid frame that makes the shed a very robust structure and will also ensure that it lasts for many, many years. The door is just as well made as the cladding and the frame. It is supported with some very well made framing so it will not become weak and flimsy as the years go by. The Mercia Shiplap Reverse Apex 8 x 6 Shed is the kind of shed that manages to have a very classic shed kind of look all the while also having a little bit of modern style. We feel it is the kind of shed that a person who wants something that has that classic shed look would want. The reverse apex design is interesting as it means most of the size is in the width and not the depth. At just over 8 feet wide and a little over 6 feet deep, this is actually one of the more spacious 8 X 6 sheds that we have seen. It is offering a very nice amount of storage space, but it does not require a lot of room in your garden. Along the ridge of the shed the headroom is over 7 feet high which is very impressive for a shed of this size. It means working to just putting things in and out of the shed will be a comfortable experience. We really like the reverse nature of this shed and the apex roof they have used is quite eye catching. The roof does slope down towards the door which may be an issue for some people if they do not like the idea of the rain running down the side of the shed where the door is. The materials used for the shed are roofing felt and 8 mm thick solid sheet boarding. We have seen some people complain that this is too thin, but it is more than functional. The Mercia Shiplap Reverse Apex 8 x 6 Shed has some very smart looking cladding. They have gone for 12 mm thick tongue and groove shiplap cladding. We really like the style of this cladding and feel that it does make the shed look very classy and high quality. We would go as far to say that most of the budget in the design for this shed went to this thick and well made cladding. Along with a strong cladding this shed also has a very strong frame connected to it. The dimensions of the frame are 45 mm x 27 mm which is solid and thick. It is going to make this one very strong shed. If you just have kids running around the garden banging into the shed, kicking balls off it and so on, the cladding and the frame are so strong that this shed will be able to handle it. Now we do feel that they kind of cheaped out with the floor as they have gone for 10 mm thick solid sheet boarding. Now granted not many people will care about what the floor looks like, but we would have liked to have seen at least a 12 mm thick flooring inside of here. Still at the end of the day as long as you are not hosting line dancing parties or hoe downs inside here the floor will be fine. 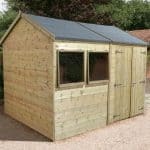 As is the case with most sheds in this kind of price range, the Mercia Shiplap Reverse Apex 8 x 6 Shed does require treatment once it has been installed. You are always best doing this as soon after installation as you can. Also on an annual basis you will want to give it a fresh coating of wood treatment. You do this and things like rot and decay will never be an issue for you. 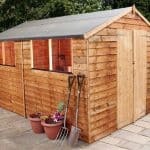 This shed comes with a ten year anti rot guarantee which is more than fair, but like other similar sheds, this warranty is only valid as long as you treat the wood properly. We always like how a door looks on a reverse apex shed and the Mercia Shiplap Reverse Apex 8 x 6 Shed is no different. This is just a single door, but at 5 feet 6 inches high and 2.42 inches wide, this is more than enough room to get things in and out without having to turn and spin them around like you are playing some kind of giant game of Tetris. The door is very well made and has two z braces on the back to help make it strong. We love the window that is on this shed. It is a nice long window that is made with styrene so you never have to worry about broken glass. Which is awesome if you have a little David Beckham who likes to play football in your garden! 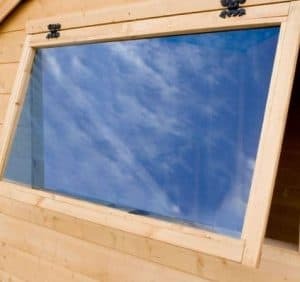 This window is a good size and it can even be opened so you can let some fresh air inside the shed. Finishing the shed off are these very old school looking hinges that we really like. In all we are very impressed with the design and the quality of this window. We like many things about the Mercia Shiplap Reverse Apex 8 x 6 Shed, but it does not have much in the way of security. All that is keeping the door closed is a turn button catch. This is ok if you simply want the door to stay closed but if you have a mower, the kids bikes or the Ark of the Covenant in there, then you will want to add some kind of lock to the shed. While we really like the window on the shed, it is in a position that makes it very easy to look inside. Just be sure to keep your more expensive items a little bit hidden or if you are really worried about privacy add in a bit of fabric, blinds or even some window film to help keep things hidden away. 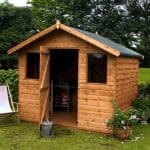 If you do want to give the shed your own little bit of personal style, then the easiest and most practical way to do this is with the wood treatment. While clear and brown are the most obvious ones to go for, there is wood treatment in all different colours out there. Red, blue, green and many more colours are available. So if you do want to give the shed a bit more of an outgoing personality have a think about a coloured wood treatment. 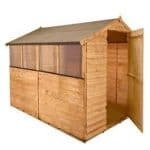 There are a couple of extras on offer with the Mercia Shiplap Reverse Apex 8 x 6 Shed. They have a couple of wood treatment options, but these are just basic brown ones. One thing they do have, though, is a good security hasp and padlock set. This is priced at just £4.99 and this is actually a very fair price for a locking system like this. There are so many good things about this shed that for the most part they did a great job. We just wish the floor and perhaps the roof were made with a little thicker boarding. You are going to get many years of use out of this shed. As long as you treat it right then you will not have any problems with the materials. This is actually just a hair bigger than the 8 X 6 in its name suggests. You have a good amount of floor space to make use of here. Also the headroom is ideal for stacking things up high and those of you who are really tall. Get a friend round, put the kettle on, get a multi pack of Snickers bars, turn the radio on and you are set. This is a pretty straightforward installation and apart from the odd fiddly part, you will not have any trouble. 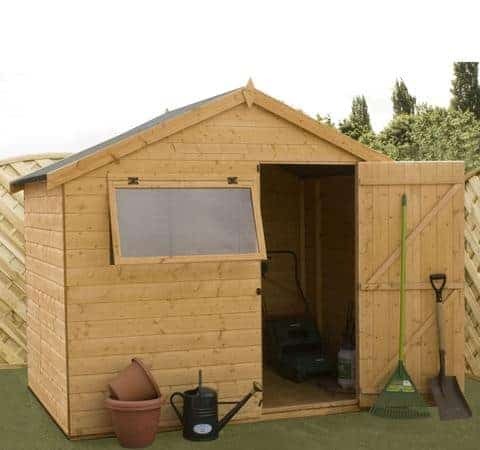 The £399.99 asking price for this shed is fair and certainly in line with what other similar sized sheds are asking. We really like the overall design of the Mercia Shiplap Reverse Apex 8 x 6 Shed. This is a shed that we are sure many people are going to like. We think that the door placement and the design of that window really do give it a lot of style. As well as looking good, the thickness of that tongue and groove shiplap cladding and the frame it is connected to make it a very robust shed. We must admit that we wish the floor was a little bit thicker, but at this price range, we cannot be too harsh on the shed for using a floor like this. 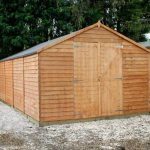 In all this is a good looking shed that offers a decent amount of floor space and it should certainly be on your radar if you are looking for a 8 X 6 shed.